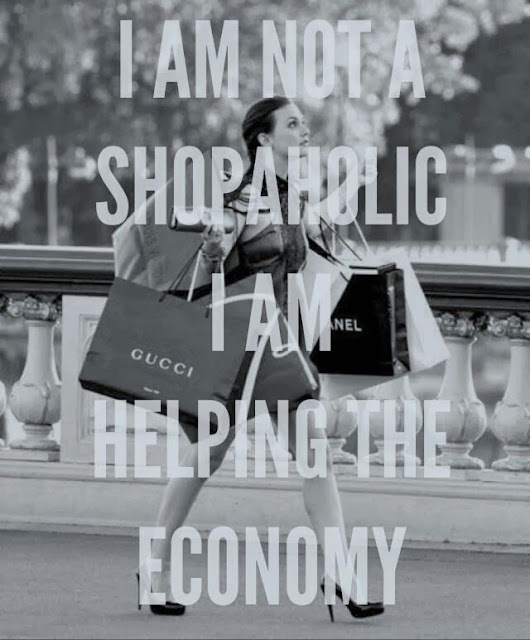 FASHION | 15 Signs You're a Shopaholic. | Nicki Kinickie Nicki Kinickie: FASHION | 15 Signs You're a Shopaholic. FASHION | 15 Signs You're a Shopaholic. We all love a splurge don't we? Sometimes there is no better feeling than the rush of buying a new outfit or new bag. It can suddenly lift our spirits after a bad day or just generally make us feel that bit more amazing BUT, can there be such a thing as too much shopping?! Surely not I hear you gasp? After all, we NEEEED clothes to avoid the awkward situation of ending up naked in public don't we? And we need shoes so that we don't hurt our feet walking on pavements? Also, bags are a place for our car keys, lipstick and purse to live too and seeing as we have to buy one it may as well be pretty......and on trend. There can never EVER be such a thing as shopping too much. 1) You find yourself choosing between buying dinner or buying a new top..........and opt for the top. 2) You discover an outfit or two in your wardrobe that still have the tags on which you had completely forgotten you had bought......and you bought them three days ago. 3) You put clothes in the wash just so there is space in your wardrobe. 5)......and have your card details stored for convenience. 6) You stand in a shop for ages or hover over the 'checkout' button online for an eternity justifying why you absolutely need this new dress / blouse / pair of shoes. 7) The reason you come up with is: It would have been your first pet goldfish's birthday today and it died when you were 7 which was your first experience of death and it is still quite traumatising to think back to, so new togs will make you feel better. 8) You never wear the same item of clothing twice. EVER. 9) You want to name your kids 'Burberry' or 'Mulberry' and think that's perfectly acceptable. 10) Whenever you are invited anywhere, the first thing you think is 'I will need a new outfit' even if you have been invited to the supermarket..........by your nan. 11) You get sweaty palms and palpitations if you haven't browsed your favourite clothing website for a day. 12) You lie all the time and never admit an outfit is new, you just reply with: 'This old thing?! I have had it ages!' You also hide shopping bags or throw them straight in the bin. 13) When browsing the 'new clothes' section of magazines you find you own most of the items already.............and have for some time. 14) The high street stores call you, email you or write to you to make sure everything is OK because they haven't had your custom in nearly a week. 15) Everyone assumes you must be secretly rich.